With our bicycle trip around the world, we would like to raise attention for the difficult situation in which many children around the world are growing up. We are confronted with these circumstances which usually are far removed from the western world. We want to show the planet through their eyes, by writing stories about what we experience and by sharing our pictures of the world. Awareness is not the only goal we pursue. Through Sabine Molemans, a Belgian native who has been living and working in Nepal for many years, we have connected with a Nepalese school in the village of Sarangkot. Amar Jyoti Lower Secondary School lies just below the crest of a hill by Sarangkot. Children come to this school from miles away. However, about half of the children do not attend the school regularly, because in Nepal children are not obliged to get education. For the 180 children who are inscribed in the school, there are not enough classrooms or teachers. It is a government school. However, the government is not able to support it adequately. 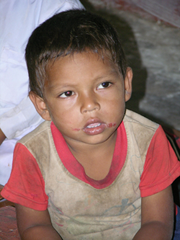 We would like for the children in the Amar Jyoti School to have a chance for a better future. We consider education a basic need for every child. To make this available, we are raising money to help the school to expand. The first goal is to raise enough money to pay for the addition of two classrooms. If we manage, each class will have its own room. Library facilities will be created. 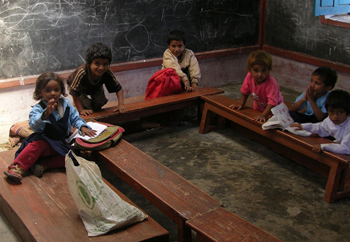 Would you like to sponsor the school in Nepal? By transferring 50 Euros to the bank account of the Belgian/Nepalese foundation Quality of Life Nepal, you will get a one-year subscription to the ’Cycle The Planet Postcard Campaign’. Six times in the year, you will receive a postcard from somewhere in the world, sent by us. Sabine Molemans is the contact person in Nepal. Her Nepalese husband Ram Chandra Sharma founded Quality of Life Nepal. We as well as the foundation will make sure that no donations get stuck between the one who gives and the school which receives. With an administrative support team in The Netherlands which includes Fleur Prompers, Emil Moller and Olivia van de Koppel, together with Quality of Life Nepal, we will do the best we can to reach our goal. Please join us in helping these children and send us an email (project@cycletheplanet.com). Depending on when we have internet access during our trip, we will contact you as soon as possible with further details. We are currently looking for a company to sponsor the mailing costs of the postcards. As long as we are not successful in this, we will cover the postage costs ourselves. Donate to our project and receive postcards, share a subscription and send us two addresses in order to each receive three cards or buy a subscription as a special gift for your friends!